Take the HDMI output from laptop computers or consumer cameras and convert it to SDI for use with broadcast switchers, routers, monitors and more! The multi rate 3G-SDI automatically switches between all SD and HD formats up to 1080p60. You get 2 SDI outputs, support for Level A and Level B equipment, and power over USB. 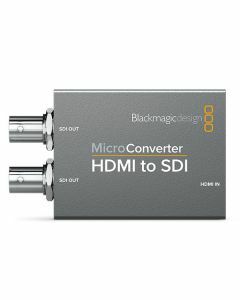 The Blackmagic Design HDMI to SDI Micro Converter takes the HDMI output from laptop computers or consumer cameras and converts it to SDI. This signal can then, of course, be used with broadcast switchers, routers, monitors and more. The multi rate 3G-SDI automatically switches between all SD and HD formats up to 1080p60. Two SDI outputs, support for Level A and Level B equipment, and power over USB are also provided. Blackmagic Design Micro Converters can be used anywhere, they’re that small. These professional, broadcast quality converters can easily be concealed so the audience never notices them. Whether you’re carrying one in your laptop bag or an outside broadcast van and road cases - they’re ideal for use on set in broadcast news or at live events utilising screens and cameras all around. Unlike other minute SDI converters, Blackmagic Design Micro Converters only use the highest quality broadcast technology miniaturised into a proper metal enclosure – delivering an industry-leading design you can trust. Full size professional 3G-SDI connections, HDMI and more are all provided. The converters include two LED status indicators to confirm power and video signal, as well as a power supply that has a USB connection. This means it can be powered from the wall or indeed any USB socket on a television or a laptop computer. Whether you’re working in SD or HD, Micro Converters utilise the same broadcast quality 10-bit video processing found in full size converters, this means the user always gets professional industrial strength SDI signals. Blackmagic Design Micro Converters also work with 8 and 10-bit broadcast quality video in all SD and HD formats up to 1080p60. Full support is included for embedded audio and closed captioning. Power Supply: +5V universal power supply included with international socket adapters for all countries.